Greenworks is a huge global company and manufacturer of hedge trimmers and other electric garden tools. 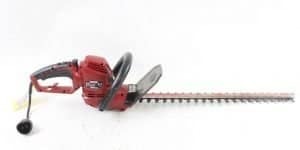 They have a focus on environmental friendly tools, which means they focus on electric and especially battery powered hedge trimmers and other power tools. They see themselves as innovators of the modern world in which people want smart, green and clean solutions for tools around the house. For people who love gardening and DIY. They have offices in China, Sweden and in Moorseville, North Carolina. We have reviewed 2 popular models of the brand Greenworks. Read them below. We also have an extensive buying guide and review page. This trimmer comes with a 40-volt lithium-ion battery made to be long lasting and convenient. 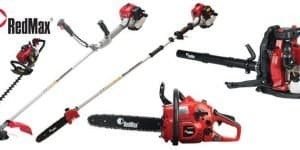 The battery, as well as a charger, come with the hedge trimmer, keeping you from having to spend the added money to purchase these items separately. This model has a 20” dual action blade with a 5/8” cutting capacity, making it great for most small- to medium-sized jobs. This trimmer also comes with a 3-position pivoting head. The battery on this trimmer is sure to last you long enough to get through most jobs before needing to be charged again. If for any reason you are going to be working on a very long task, it’s always a great idea to purchase a second battery so that you can have one charging while the other is in use. If you manage to run the trimmer until the battery has run out of power, the great news is that it doesn’t take long to recharge. 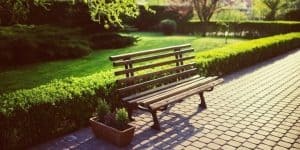 You’ll be able to take a quick break or spend some time working on a different project and be back to finish your trimming in no time flat. 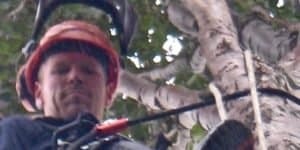 With the added pole feature on this trimmer, you’ll be able to easily reach branches that are up high with little effort. You won’t have to worry about an unstable ladder or straining yourself trying to complete the job. 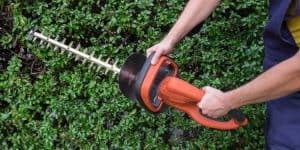 With this trimmer, you’ll be able to easily reach the tops and tall sides of your hedges with little effort. It’s bound to save you a lot of money over calling in a professional. Particularly with the extended pole, this trimmer can be a little bit awkward to use. Like many pole trimmers, it can be slightly top heavy and require a firm grip to keep control. It’s recommended that you be careful when using a pole trimmer so that you don’t accidentally drop it or end up cutting through things that you didn’t intend to. Overall, this is a heavier trimmer. 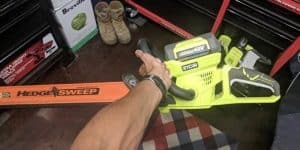 It’s not quite as heavy as what you might find in a gas-powered trimmer, but it’s still worth making sure that you’ll be able to handle the device for longer periods of time. It’s also always a good idea to take breaks as needed. 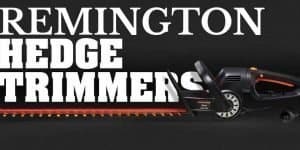 This trimmer comes with a 2.7-amp electric motor and an 18” dual action steel blade, making it perfect for small- or medium-sized tasks. It has a cutting capacity of 3/8”, allowing it to handle most smaller branches. This model is lightweight and has a cord lock to keep the cord from accidentally being unplugged. This trimmer only weighs about a mere 5 lbs., making it very easy to carry and use. 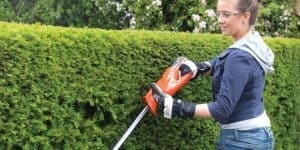 It’s great for people of just about any level of proficiency with hedge trimmers. You won’t have to worry about it causing any strain to your arms or back. Because of the lightweight design, this trimmer is incredibly convenient to use. This model is also quiet, meaning you won’t have to worry about it damaging your hearing without ear protection. 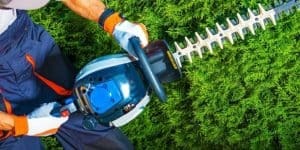 Noisy hedge trimmers can be very disturbing both to the user and their neighbors. With this trimmer, you won’t have to worry about either problem. This will be especially useful during the summer months when you want to get your work out of the way before the heat of the day sets in. A lot of vibration can cause discomfort in your arms, causing them to feel tingly or numb if you’ve been holding the device for a long time. With this trimmer, you won’t have to worry about that because it has very minimal levels of vibration. 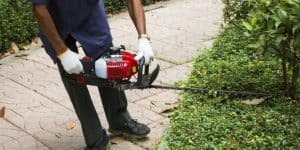 This will allow you to remain comfortable as you work to get your hedges, bushes and other plants trimmed into the ideal shape. The cord on this trimmer is very short, so it’s important to make sure you have an extension cord available that can easily reach the area you are working, as well as allow you room to maneuver easily. Also, make sure to be careful not to use this trimmer in damp weather, as getting the machine wet can have negative effects. In a few instances, this trimmer has been known to stop working unexpectedly. It’s more than likely these are due to small issues in the trimmer itself. Just in case, it’s always a good idea to make sure you understand the terms of the warranty prior to purchasing it. That way, if anything should happen, you will be able to get it repaired or replaced easily.